The world today faces numerous challenges, including ongoing fallout from the international financial crises and instances of interstate conflict. Combined with the many changes affecting the regional and global balances of power these challenges raise questions about how power will be distributed in the coming two decades. With this in mind, the Emirates Center for Strategic Studies and Research (ECSSR) held its 16th Annual Conference on “Global Strategic Developments: A Futuristic Vision” in Abu Dhabi in March 2011, and recently published the conference’s papers. Available from the ECSSR through the link provided below, the volume provides a professional and academic investigation of the global challenges that lie ahead. Dr. John Duke Anthony, Founding President and CEO of the National Council on U.S.-Arab Relations, contributed an essay to the Global Strategic Developments: A Futuristic Vision volume on “The Future Significance of the Gulf Cooperation Council.” Since its founding in May 1981, the Gulf Cooperation Council (GCC) has often been misunderstood in terms of its nature, founding principles, and how it has evolved. Although only thirty-one years old, the GCC and its members’ contributions to geopolitical dynamics are numerous and diverse. An examination of some of these geopolitical achievements is of special interest and value. Doing so provides insight into the prospects for additional accomplishments occurring in the future. Dr. Anthony’s essay on “The Future Significance of the Gulf Cooperation Council” is available through the link below. Download the article to read more about GCC involvement in regional issues including the 1980-88 Iran-Iraq war, the 1990-91 Kuwait Crisis, the 2011 Bahrain Crisis, and much else. Looking forward ten or twenty years, can the GCC countries be expected to play similar roles? Is it likely that, collectively or individually, the members would act to deny success to a non-GCC country that sought to intimidate or attack a GCC member? Dr. Anthony discusses these kinds of questions and more in his analysis of this unique and exceptional sub-regional organization. The Emirates Center for Strategic Studies and Research. 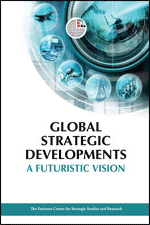 Global Strategic Developments: A Futuristic Vision. Abu Dhabi: The Emirates Center for Strategic Studies and Research, 2012. 63-103. Print. This entry was posted in Bahrain, Gulf Cooperation Council (GCC), John Duke Anthony, Kuwait, Oman, Qatar, Saudi Arabia, UAE.